A few weeks ago, Stephanie to participate in The Edible Word for Confections of a (Closet) Master Baker by Gesine Bullock-Prado. Bullock-Prado’s book is a fun read — though the publishing company organized some of the recipes and chapters a bit oddly and I am bothered by the author’s attitude toward people who aren’t thin. 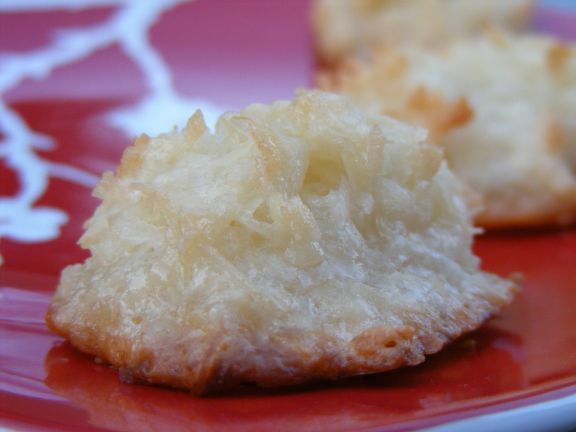 Bullock-Prado is known for her french-style, almond macaroons. It’s a recipe and cookie near and dear to her heart, which she writes at length about. Unfortunately, it’s so near and dear that she doesn’t share her recipe with her readers. Still all this talk about macaroons had me craving *coconut* macaroons and, fortunately, Bullock-Prado provides a nice recipe for these on her blog. They come together quickly and easily — and the result is absolutely delicious. I didn’t dip these in melted dark chocolate, but that would be a nice touch! Preheat oven to 300-degrees F. Line two baking sheets with parchment paper; set aside. Combine all ingredients into a metal/heatproof bowl and set the bowl on a saucepan of simmering water. Stir occasionally to prevent the bottom from burning. When the mixture is hot and has thickened slightly (about 10 minutes), use a medium sized cookie scoop, to scoop and drop batter onto the prepared baking sheet. Bake for 15 to 20 minutes, or until the edges are dark golden brown, rotating the pans from front to back and top to bottom half-way through the baking time.